The Apple veteran holds a Masters in Computer Science from Stanford University and was one of the original architects of Mac OS X and its Aqua user interface. During his 11-year tenure at the company, Forstall has been responsible for several releases of the operating system, most notably Mac OS X Leopard. Prior to Apple, he also worked alongside Jobs at NeXT, where he developed core technologies for the platform.
. I'm not sure what I am going to do, but I think I am going to have to ask you to leave the company." 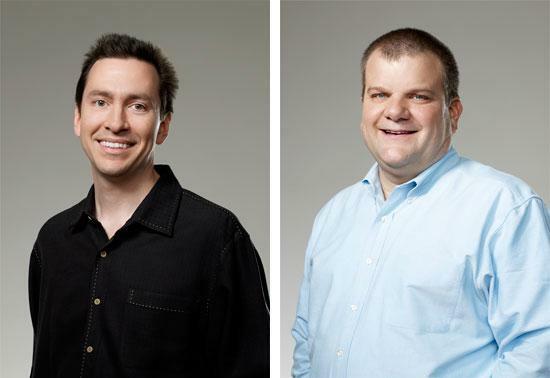 The faces behind Apple's iPhone and Mac. Pictured from left to right: Scott Forstall & Bob Mansfield. Alongside their executive promotions, both Forstall and Mansfield were awarded a grant for 25,000 restricted Apple stock units worth more than $4.17 million as of May 30th, the day the two signed regulatory filings with the Securities and Exchange Commission. The stock units are scheduled to vest in full on March 24, 2010.